The new The 75 carriages have had a luxury makeover and will now offer en-suite double rooms for the first time.There will be 484 rooms available, initially on the Lowlander route between London and Glasgow/Edinburgh.They will be followed by a Highlander route between London and Aberdeen, Inverness and Fort William. 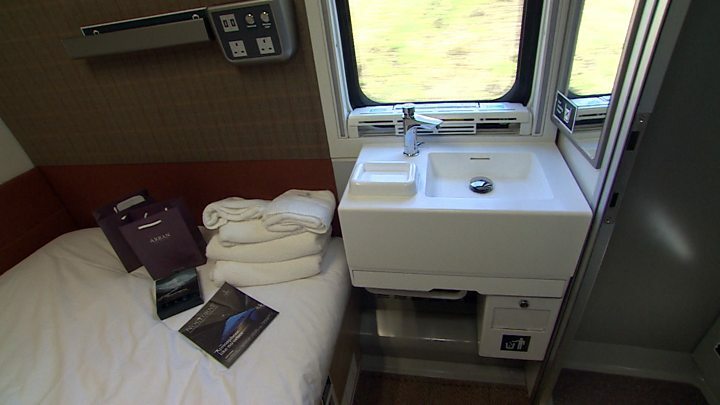 The Caledonian sleeper, which has been running in various forms since 1873, is now operated by Serco on behalf of Transport Scotland.Its new carriages are bespoke and designed for Caledonian Sleeper from scratch. He added: "Safety is absolutely paramount for us. But, beyond that, this is a hospitality experience. "People now are very much looking for a decent experience - whether it is in a restaurant, a shop or indeed travelling on a train - and we have gone after that market. "So it's no longer a transactional, overnight thing where you're not going to get a great sleep or a great breakfast. We want to be the best at every single step of the journey." Another first for the Sleeper is the introduction of new engineering technology to stop things going "bump" in night.In the past, passengers have complained of being woken by a shunt when two sections of the train coupled together at Carstairs.But the operators say the addition of 150 Dellner couplers will be a "dream" development for snoozing guests.Serco's Ryan Flaherty said: "On the current train the coaches have to 'kick' together to make the contact, but going forward it's 'kissing'. "It's much more gentle and will be imperceptible to the guests who are asleep."